This section is from the book "The Wonder Book Of Knowledge", by Henry Chase. 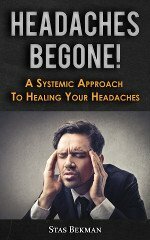 Also available from Amazon: Wonder Book of Knowledge. The ten years following this first instance of a successful reaper were strenuous times indeed for Cyrus McCormick, for it was not until 1840 or 1841 that he was able to make his first sale. Twenty more were sold in 1843 and fifty in 1844. During all these years from 1831 to 1844 Mr. McCormick was diligently at work changing, testing and experimenting. In 1845 he secured a second patent, which embodied many improvements - the principal ones referring to the cutting mechanism. 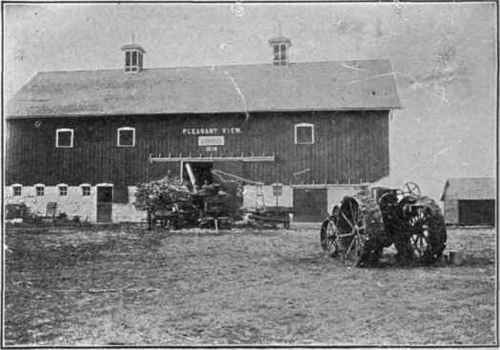 The Progressive Farmer of Today does not let His Cornstalks go to Waste in the Field, but Cuts Them with a Corn Binder and Either puts Them into a Silo or Shreds Them into Stover for His Hay-loft This picture shows the husker and shredder in operation with. The McCormick Reaper of 1858 in the Field. 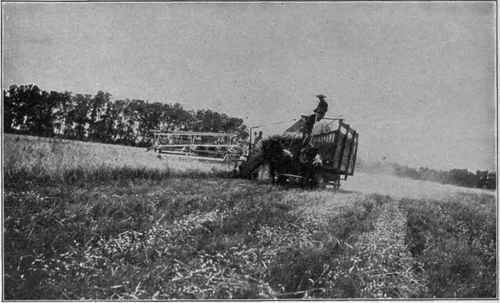 Note that an automatic raker has been substituted for the man who rode on the machine and raked off the cut grain. In this year, Mr. McCormick started for the western prairie, and in 1847 built his own factory in Chicago, thus starting the world's greatest reaper works. This factory, known as "McCormick Works," is still in progress. It covers today more than 120 acres in the heart of Chicago, and has an annual capacity of 375,000 machines of all types. 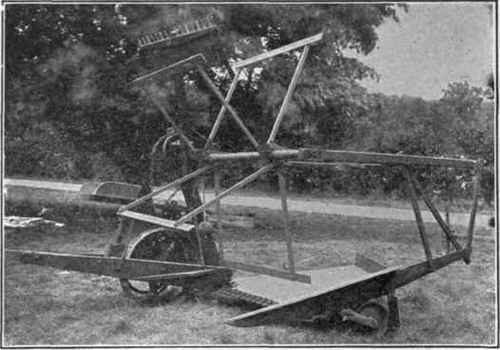 The third step in the development of the reaper was the addition to the machine of a seat for carrying the raker. The machine built in 1831 required that the raker walk by the side of the machine. In 1845 Mr. McCormick added the seat, patent for which was added in 1847. This seat which carried the raker enabled him while riding to rake the grain from the platform and deposit it in gavels on the ground. This type of reaper, patented in 1847, is the one taken by Cyrus H. McCormick to the first world's fair held in London, England, in 1851, and about which the records of that exposition state "The McCormick reaper is the most valuable article contributed to this exposition, and for its originality and value and perfect work in the field it is awarded the council medal." 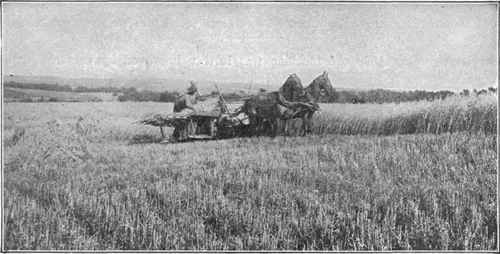 A Marsh Harvester as Built by the McCormick Company in 1874. Note the two men riding on the platform and binding up the grain as delivered to them by the elevator of the machine. A McCormick Header Binder which Elevates the Grain into Wagons which Drive. Alongside cessful reaper. In 1858 the machine was further improved by substituting an automatic rake for the raker on the machine. Many other patents were granted from time to time until 1870, when the foundation features of all reapers had been invented and substantially perfected. The reaper is still used extensively, especially in foreign countries. The interest in this machine centers not in its development as used today, but in the fact that it led to the invention and perfection of the self-binder. The prototype of all machines designed to bind the grain before being delivered to the ground is the Marsh harvester. It is the half-way mark, the child of the reaper and the parent of the self-binder. The original patent for this machine was granted August 17, 1858, to two farmer boys of De Kalb, Illinois, the Marsh brothers. 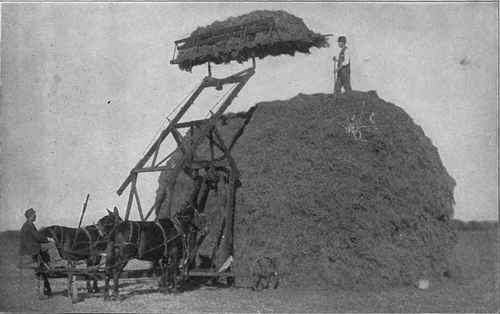 Previous to this time, attempts had been made to build harvesting machines which would bind the grain before delivered to the ground, but not one could be considered a success. At the time the Marsh harvester began seeking a place in the market, about 1860, reapers - hand-rakers, self-rakers, and droppers - held the trade substantially to the exclusion of any other kind of harvesting machine. The first successful Marsh harvester, built in 1858, was operated through the harvest of that year. It has never been changed materially in principle or form since. The theory of the inventors was that two men might bind the grain cut by the five-foot sickle in ordinary motion provided it could be delivered to them in the best possible position and condition for binding and if they could have perfect freedom of action. They knew that the binders must have a free swing and open chance at the grain to enable them to handle it, so they arranged the elevated delivery, the receptacle, the tables and the platform for the man with these things in view. A Combined Sweep Rake and Stacker. This ingenious machine is a great labor saver in the hay field. The hay can be gathered by any number of sweep rakes and dumped near the stacker, which will stack on any side and in any shape. The second Marsh harvester was built in Chicago in 1859. Improvements were made during the years 1861, 1862 and 1863. 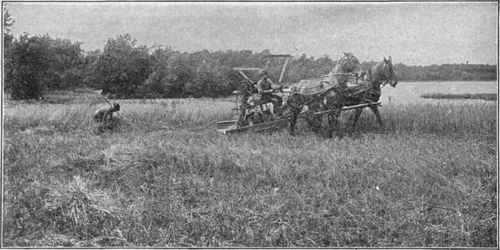 The manufacture of the Marsh harvester began in earnest at Plano in the fall of 1863 by Steward and Marsh, twenty-five machines being put out in 1864.